Put pork tenderloin into slow cooker. 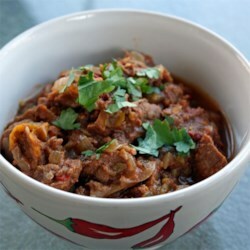 Pour picante sauce over the pork; add green chiles, chipotle peppers in adobo sauce, and lime juice. Cover and cook on High until the pork is tender enough to be shredded easily with 2 forks, about 5 hours. Remove pork to a cutting board, shred, and return to sauce. Continue cooking on Low another 3 to 4 hours.